1. Begin the day before. Lift up the top muscle of the meat and trim off the excess, but not all, fat. 2. Mix 200g honey and chicken stock together in a large shallow dish, add the beef, cover with clingfilm then marinate in the fridge for 24 hours. 3. The following day, preheat the oven to 220°C, gas mark 7. Remove the beef from the marinade and pat dry using kitchen paper. Reserve the marinade mixture. 4. Heat the dripping or oil in a roasting tray, add the beef and turn to colour the meat well on each side. 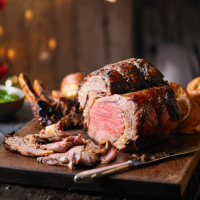 Sit the beef in the tray so it stands on the bones, season, and roast for about 30 minutes, before reducing the temperature to 180°C, gas mark 4 for the remaining cooking time – about 1½ hours for medium. 5. When the meat is cooked to your liking, remove from the oven. Transfer on to a carving board and carefully remove the meat in one piece from the bone. 6. In a separate bowl, mix together the remaining 100g honey and the horseradish sauce and generously brush over the beef, before leaving to rest in a warm place for about 30 minutes. 7. Skim off all the excess oil from the roasting juices. Return the roasting tray to the hob and over a medium heat add the onion slices and cook for 3-4 minutes until golden, then add the red wine and reduce by half. Remove from the heat and strain into a clean pan, then add the reserved marinade liquid, return to the heat and bring to the boil. Allow the gravy to reduce by half. Check the seasoning and beat in the cold cubes of butter, a couple of cubes at a time, until smooth and thickened. 8. Return the beef to the oven at 180°C, gas mark 4, for 10 minutes. Slice and serve with the gravy.